First things first -- and this is true for all Windows tablet: they simply don't have the apps available yet that the iPad and Androids do. ("Yet" is the operative word. I think Windows tablets is a growing field, and as it grows the app world will grow.) Further, most people use half a dozen apps regularly, so the fact that one system has half a million, is not as huge a deal as it sounds. Also, with Windows, if an app doesn't exist, you can often simply bookmark its web equivalent, and pin it to your Start page. (Here's what I mean: there's no Dropbox app, but you can open your browser, go to Dropbox.com and pin the actual website to your Start page. Clicking the icon there will take you directly to Dropbox -- and not just a limited app, but the real page.) But to be clear, yes, there is a vast lacking in Windows apps for all Windows tablets. I was very impressed with the ASUS T100, though it comes with some drawbacks you have to live with -- but they're livable, particularly if you want this for a backup device or something to carry along with you, not as a desktop replacement. But it's an extremely good tablet / laptop hybrid. And it comes at an extremely respectable price. More on that below. The tablet has a 10.1" display and comes with a keyboard that doubles as a cover. They snap together and lock, making the device easy to pick up and carrying around when connected. The display can be angled like any laptop. Pulled separate, it works very well as a standalone tablet, though it's a little thick, but not problematically so, and weighs 1.2 pounds. With the keyboard, they're just under 2.4 pounds. The T100 comes with a quad core Atom processor which is reasonably fast and most notably provides up to 11 hours of battery life. (Tests I've seen from others who can do such things better than me show it running just under a healthy 10 hours in real-world conditions.) You should also get two weeks of standby. By the way, "reasonably fast" is subjective. The Atom processor is designed to be lower power and allow for longer battery life, idea for tablets. As such, you'd find it sluggish if you wanted to run half a dozen programs at the same time. But having two or three programs running were fine, and movies played back smoothly. This is a Windows Pro device and comes with Windows 8.1 installed. That means you can run both desktop Windows -- and install any standard Windows programs you have -- and the Metro interface with Tiles (also known as the Modern Interface.) Windows ran impressively smoothly, and switching between the two interfaces was fast. The biggest downside is that the keyboard is a bit cramped, especially if you have chubby fingers. And it's a little thin and light. But I found it easy to type on, albeit slower than I'm used to. (Disclaimer, I don't have chubby fingers...) Though the layout isn't the same as a standard keyboard, I found it easy enough to get used to. I could do serious work with it -- the great advantage of a Windows 8.1 tablet/keyboard -- but it's definitely not for power users, and it's probably not something I'd want to work on for many hours at a time. The 10.1" display comes with a 1366x768 resolution, which is not state of the art. Though not as bright as some of the competition, I found graphics quite sharp. I'll acknowledge that high-end resolution is not one of my great concerns -- I appreciate when resolution is ideal, but I don't find I need it. Intense game players would want the highest resolution. I'm not an intense game player. I mainly am looking for a productivity device. As for the display, "Wake-up" was near-instant, about two seconds. The build quality is very good, though both the tablet and keyboard have a more plastic feel than metal. The bottom of the keyboard is a bit slick, though a couple of rubber pads helped keep it steady. There is a 1.2 megapixel front camera, none for the rear. But I've never found tablets particularly interesting for taking pictures. Besides, most people will have a mobile phone for that. And not having a camera you'd almost never use keeps the cost down. But for using a service like Skype, the front camera is fine. I thought the speakers were quite good. Hardly top fidelity and a little thin, but overall extremely listenable. 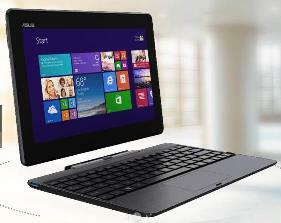 The device comes with Microsoft Home Office & Student 2013 pre-installed. You get ASUS WebStorage free for one year, a nice service but there are a lot of free cloud services available. Speaking of storage, the T100 will automatically back up your data if your battery reaches only 5% remaining. Impressively, the ASUS Transformer Book T100 has a retail price (at the time of writing) of only $399 for the 64 GB model, and it could be found for as low as $349 online. And that's with the keyboard included, not an accessory. The keyboard is a little cramped, but very usable. The screen isn't the highest resolution, but good. But overall, this is an extremely good tablet / laptop hybrid that offers a great deal of productivity for people who want a backup to their main computer, something they can easily grab for real work on the road. 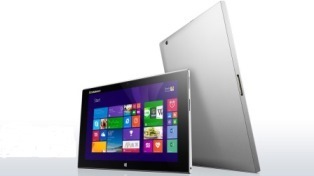 Lenovo has a new line of Windows tablets. They each offer their own advantages -- from the mini-sized 8" to the almost laptop-sized 11" -- with the 10" model seem me as striking the best balance between productivity and portability. The 10" has some features that are extremely impressive, though a few that might be more problematic for some, but if those strong features fit your needs, the Lenovo Miix 2 can be a gem. 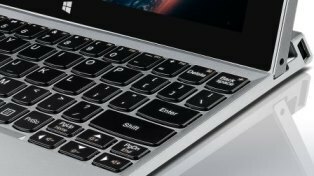 The strength of Windows 8 tablets is that they are productivity devices, and what stands out with the Miix 2 10" is the keyboard, which is comfortable enough for serious, extensive typing. There's a caveat to this, but at its heart, the keys are wide enough for people even with large fingers. The caveat is that, to make the keys this comfortable, they had to shift around some of the secondary keys (like Home/End/Delete and such), and so their placement is non-standards. If you do a lot of switching between a desktop and the tablet, it takes a bit of adjustment -- hardly a huge issue, but something to be aware of. If much of your typing is on the tablet only, though, adjusting won't be a problem. 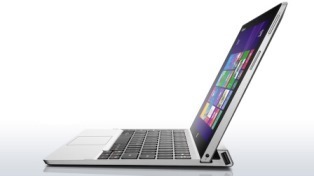 The keyboard, which serves as a cover, docks with the tablet for typing with a magnet, rather than locking in. But the magnet is extremely strong and holds things in place quite well. The upside is that this allows for easy and fast connecting. Also, there are two modes: in addition to the standard Tablet Mode you can flip the tablet end-for-end, and set things up very nicely for watching movies in what they call Stand Mode. There are two quibbles here, though. One is that you can only set the screen in one angle, there's no adjusting. The other quibble is that, while the keyboard and tablet stay attached very well when working, if you want to pick them up and move, they will likely come apart unless you're very careful. By the way, having noted above the screen angle for watching movies, know that the tablet screen has very good backlit 1920x1200 resolution, and the JBL speakers with subwoofer on the keyboard dock provide some of the best sound I've heard on any portable device -- whether a tablet or even a notebook. Another impressive feature of the Miix 2 is that it comes in either 64 GB or 128 GB, the only Windows tablet I've come across (other than the Microsoft Surface) with that extended storage. If you plan to use a tablet for heavy lifting, loading a lot of programs and all your music and photos, that extra capacity is significant. Other included ports are full USB 2.0 (that resides on the keyboard dock), allowing you to attach peripherals, like a printer, as well as Micro USB, and a Micro SIM card reader, and Micro HDMI. The device runs an Intel Atom Z3740 Processor, which as noted isn't as powerful as the Haswell processor, but it gives a longer battery life, and if you only plan to run two or perhaps maybe three programs at the same time (which is basic for most people), that's plenty of power. The battery life is rated at up to eight hours, not huge but very good. And it comes with Windows 8.1 installed, along with two MB of RAM. The tablet isn't a power crusher, but I found it to run smoothly, reasonably powerful, and videos played well. It's respectably light, with the table coming in at 1.28 pounds and double that with the keyboard dock. There's another a 2MP front camera, as well as 5 MP rear camera. Other bells-and-whistles include Bluetooth 4.0 and a wireless network card. And it comes with Microsoft Office Home & Student 2013 preloaded. Though made of plastic, I found the Lenovo to have a good, solid build. Like all Lenovo's I've come across, it uses a charger with a proprietary plug, something I don't like. However, on the positive side you can charge it with a MicroUSB plug connected to your computer or an AC wall charger. The Lenovo is reasonably priced -- a bit more than some of the competition (although it has high resolution, great speakers and two cameras), but much less than the Microsoft Surface, though that's not a fair comparison, since among other things that comes with the higher-cost Haswell processor. At the time of writing, the 64 GB model is $499, and the 128 GB version is $128. Personally, I prefer the larger storage model which gives much greater versatility. Windows tablets aren't for everyone -- but they're for a whole lot more people than think they are. If all you want is basic entertainment -- email, browsing the Internet, games and such -- iOS and Androids are probably the way to fly. But Windows tablets offer much of that, too, and at their core, being Windows 8.1-based, the main value is for serious productivity. Apps are definitely less compared it iOS and Android, but there are already several hundred thousand to choose from, and growing, so the issue isn't as pronounced as generally reported. Each of the two tablets here have a lot to offer, but which is "better" depends on how you expect to use the device. As such, the Lenovo stands out for having a keyboard with a very good feel, and greater storage capacity than most tablets. And it comes with a high-res monitor and terrific speakers. But it costs a bit more, has an odd keyboard layout for secondary keys, and the monitor's magnetic angle can't be adjusted. 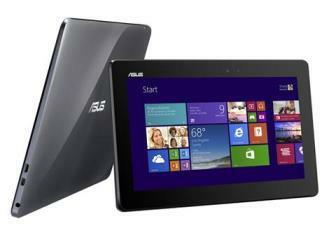 The ASUS is extremely well-priced, the keyboard dock locks in, and the layout is standard. However, they keys are a bit cramped for extended typing. I think if you're looking for a Windows tablet that is able to serve as a serious backup computer when on the road, with high-end sound and video for movies or games, the Lenovo is worth taking a close look at. If however you want a tablet for grabbing on the go whenever you leave the house, but can also provide good productivity when needed, the ASUS might be preferable. To read more from Robert J. Elisberg about this or many other matters both large and tidbit small, see Elisberg Industries.